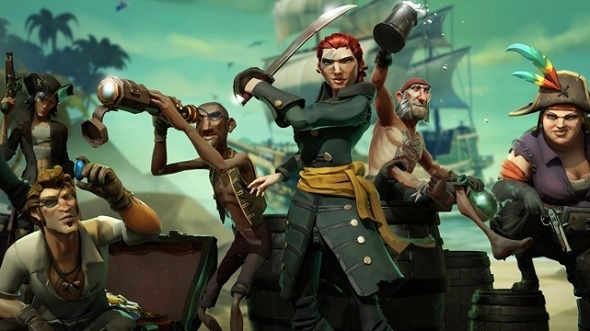 Sea of Thieves developers Rare Ltd. recently invited us to take a look at the game and speak to some of the people behind it. 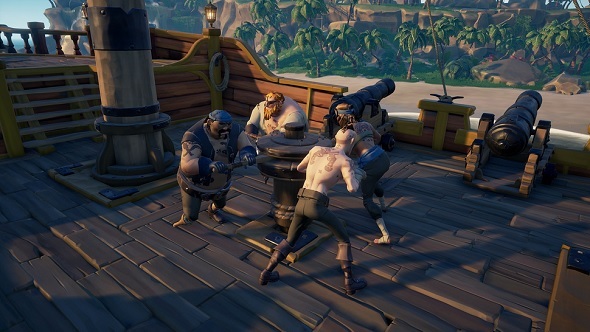 As well as finding out more about the structure of the game, how the endgame looks, and much more, we were able to sit down with PC design lead Ted Timmins to chat about the PC version of Sea of Thieves. Read what we thought of Sea of Thieves in our preview. If you want to know why there won’t be a Steam version, or find out exactly what advantages the PC version offers over consoles, here is an edited version of our chat. 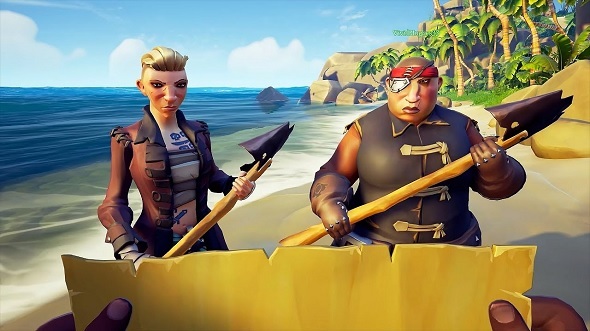 PCGN: What makes the PC version of Sea of Thieves worth getting? Ted Timmins: We knew that for something to be a success on PC, to be a service, you can’t just do a port. You want to treat PC players with respect. The goal we set out to achieve was to build a PC game that PC players expect. When you say, ‘What do PC players expect?’, that’s a pretty high expectation. If we approach it and question everything we should be in a better place. Why do PC games come out after console games? Does anyone have a good reason for that? No. So let’s make a judgement call now that the PC version will ship the same day as the console version. Then you go, ‘Well, PC players should be able to play on high-end devices and they should be able to play on low-end devices’. We shouldn’t have a minimum spec that only goes down to 1080p, we should go all the way to 540p. If you’ve got an older device or maybe you’re a young kid who can’t afford the world, then we should let them play the game. We should put in a 15 frames-per-second option because if they’re fluctuating between 15-25fps, that’s not much different than fluctuating between 30-45fps. We’ve had all of these conversations. Like, why do people ship a PC game without an unlocked frame rate? Why do people ship a PC game without 21:9 support? The answers are always really crap, so we thought, ‘Well, we’ll fix them all’. 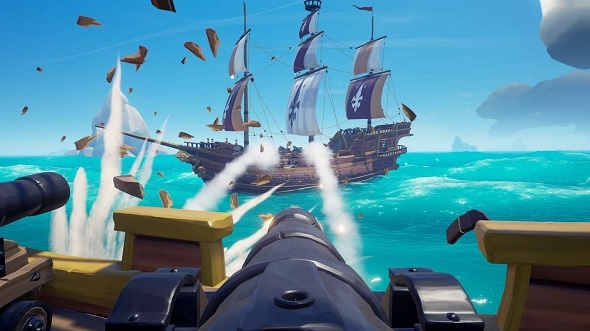 Then we hope we’ve done enough additional work around stability and compatibility – that we’ve worked very hard on – that everyone can come into Sea of Thieves and they can just play the game and it works the way they expect. A number of Microsoft exclusives on Windows 10 have recently had performance problems at launch. Is there anything you can say to people worried about the same happening here? From our perspective, given the fact that there are millions of devices out there, someone won’t have a great experience at launch. What I am confident in is that I think we have a great community and customer support team, so that feedback will filter through. Already from the closed beta, we had so many people playing on PC that we had people coming through saying, ‘My GPU crashes’. My senior PC engineer messaged me this morning, super excited, saying, ‘I’ve tracked it down, I’ve tracked it down!’. We knew that was one of our biggest crashes. For us to be able to track that down and hopefully turn around a fix so quickly, it’s an important extra bit of confidence for us. Our crash rate was something like 0.06%, and I imagine that’s pretty damn good for a closed beta. All the footage we have seen of the beta has looked good. Yeah, it’s really smooth, crystal clear. I’ve got a great example here – these are both my laptops at work. You’ve got the Surface Pro 4, which is four or five years old, and runs the game at 20fps, which is perfectly playable. Then you’ve got this end with an almost 4K screen and, again, it’s completely playable. 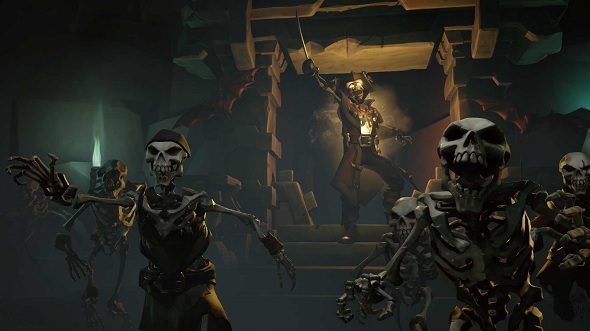 We just want players to have that choice, really – how do you want to play Sea of Thieves? Do you want to play on an old device and it’s playable but you won’t have the best performance in the world, or do you want to play on the high end? So many people put a barrier here, but our art style lends itself so nicely [to scalability]. The art style also helps with performance then? Yeah. I think if we had a super realistic art style, it might look a bit jankier. Our art team have done such a great job of building this scalable art style. We looked at a lot of games that have cross-play support, then you read the small print and it says, ‘Social mode only, not in ranked, only with friends’. It’s not really cross-play if you’re turning everything off. So we called it ‘no asterix cross-play’, with the concept of people just playing together all of the time. Do you think we will ever see Sea of Thieves on Steam? We’re motivated to have one community, we’re motivated that we have one build and it goes to all platforms at the same time. Releasing to a different platform – whether that’s Steam, Origin, or anything else – that means we have to have two builds or three builds. We wouldn’t be able to have cross-play, we wouldn’t be able to have Xbox Play Anywhere, or Game Pass. So all these things that we want to use to bring in more players from a single build, we’d lose all that. It would make [the Steam version] its own distinct version. So that’s a different customer support team, a different community team – you really have to employ and recruit. Where we are at the moment, we just want to release the game. We had some trouble downloading the closed beta on Windows 10. The store was difficult to parse. 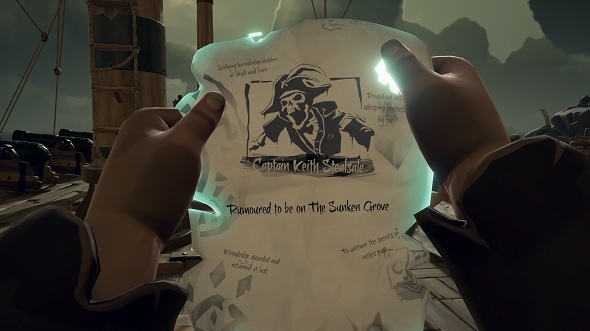 We made it hard on ourselves, but there’s definitely error on Rare’s part. We’re such an adventurous studio, so we wanted to say, ‘If you pre-order the game you get this really cool outfit’. What that meant was you couldn’t just go to Sea of Thieves on the store and click ‘play’. That will be a lot easier at launch, I promise. We created a rod for our own back, but it was with good intent. Yeah, there were also issues with lost invites when we tried to stream the game. Genuinely, from everyone at Rare, we do apologise to the people who had those kinds of troubles. But I think a lot of gamers think of betas as like a marketing thing. It’s the right approach, to question whether it’s a marketing thing, or if [the developers] are actually learning. But any game as a service that is looking to create a really long-lasting game, whether that’s five or ten years, is actually a genuine beta. Because what we’ve found is, when we had 30,000 players, our servers started to struggle. We went to our community and posted on the forums and said, ‘We’re actually having some services issues now’, which is exactly what we wanted – we don’t want that on March 20. We have this great conversation with our community where we do say, ‘Yeah, we’ve got a problem, but we’re learning from it, and we’re going to react.’ The same thing with our progression playtest over Christmas – we had a few niggles, but, again, you’re helping us make a better game for launch. Because, at the moment, everyone’s playing for free. You kind of hope that takes a little edge off – yes, it might not work, but at least you haven’t had to put money into it. When we’re saying we’ve made a $60 game that’s worth your hard-earned money, that’s when it’s gotta be perfect. That’s where the pressure comes in, and we need to deliver on March 20. Speaking of which, is Rare crazy? You’re making your first service game and you are launching it on multiple platforms at the same time. It is an ambitious plan. It’s a bold step, but humans have landed on the moon before. Haha. The thing that’s great about Rare, the reason I love working for them, it’s an adventurous studio, never resting on its laurels. Always seeing where the industry is shifting, always looking at what the next big thing is going to be, trying to stay ahead of the curve. When you look at where streaming is, and you look at service-based, emergent, online, unpredictable games – especially games that let you tell a story… every mechanic you add, whether it’s a gunpowder keg or firing yourself out of cannons, if you make it fun, it should, hopefully, be fun to watch. Throw four players and a server full of ships into the mix and it just becomes carnage. How many ships can be in a single instance? It’s a good question but I actually can’t answer it. I’ll explain why: you know how we talk about the dark arts of services, how they work… it’s very much that, when you’re a magician, you want people to understand the trick, but not how the trick works. We’ve done a lot of clever work on the push/pull. So ships come in, ships go out, but we want to keep the ace up our sleeve. But since our first tech alpha 14 months ago, I think it’s triple what it was, or double what it was. It’s fluctuating and changing all the time. Will the number of possible ships change in step with the map increasing in size? Yeah! So it’s actually more about player encounters. We want you to see other players every 15 minutes. We went to our community and asked if they felt like they were having too many or too few ship encounters. They said ‘too few’, so we increased it, increased the draw distance, added a spyglass, and increased the fidelity of what a ship looks like at a distance. We want back to the community and they thought it was great. You need those moments of not seeing another player as well. Especially as a solo player, you’re on an island and you’re looking around. Of course, some islands have a cove, so you’re going to want to hide your ship in it. Back to PC specifics – how did you balance the game for mouse and keyboard, and then for controllers? We had a divide: an Xbox tech alpha and a PC tech alpha. One of the positives of that was we got to find out how Xbox players fare against skeletons and how PC players fare against skeletons. PC players had a 4.5% advantage over Xbox players, and we’re pretty happy with that. We’re not a twitch-based shooter, particularly when it comes to ship vs. ship combat there’s no real advantage to be had – actually, the analogue controller suits the way the cannon works better. We can still improve, there’s always ways to improve. We’ve added a field-of-view slider and keyboard rebindings to both PC and Xbox, so they’re level. Then, on the PC side, we’ve had a little play around with when you fire the gun, what if it’s an actual projectile you’re firing off instead of an instant laser beam? That felt great, so we added it on Xbox too, and that became a new kind of gun combat – gun combat became about timing, not about accuracy. That’s another thing we did that had a tonal impact: the flintlock feels like a blunderbuss because it’s buckshot and not hitscan. You can make a change for cross-play reasons and it can have a positive impact on the wider game itself. That makes sense. Finally, do you support multi-GPU setups? We’re not taking advantage of them yet. When we went to our community and asked what features were important, multi-GPUs were like 0.001% of our community. So, what we did say to them is, ‘look, your experience won’t be worse’, because that’s important – there are games that stutter. We have a multi-GPU setup on-site, so we at least know it works. Every week we send builds to Nvidia, AMD, and Intel for playtesting as well. But, over time, if we bring in more players with multi-GPUs, we can absolutely revisit it.